Volcanoes are big movers and shakers in the business of continually redesigning the Earth’s landscape. With no concern for nearby people or ecosystems, volcanoes release toxic gases, climate-altering ash, lava and rock. How does this work? Are scientists getting better at predicting volcanic eruptions? How does magma move up, and out of, a volcano? What are some common volcano structures? Why do these landforms exist, and What do they tell us about the local geology and magma chemistry? What diabolical materials come from volcanoes and threaten people living nearby? Think of a major eruption–from recent news, or human history–and describe how the eruption affected people and the landscape. Did it also affect climate? How well do you know volcanoes? 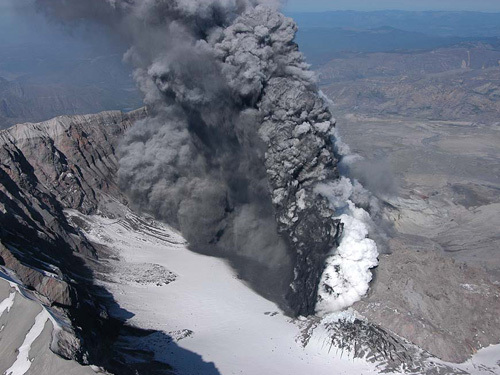 In this lesson, students investigate volcano building, eruption types, and threats to surrounding environments. Using what they learned, students can then identify physical features and eruption types in some real-life documented volcanic episodes. Recommended for grades 6-12. Collapsing caldera in the classroom! Follow instructions on this page to recreate a a collapsing caldera with sand. Recommended for all ages.